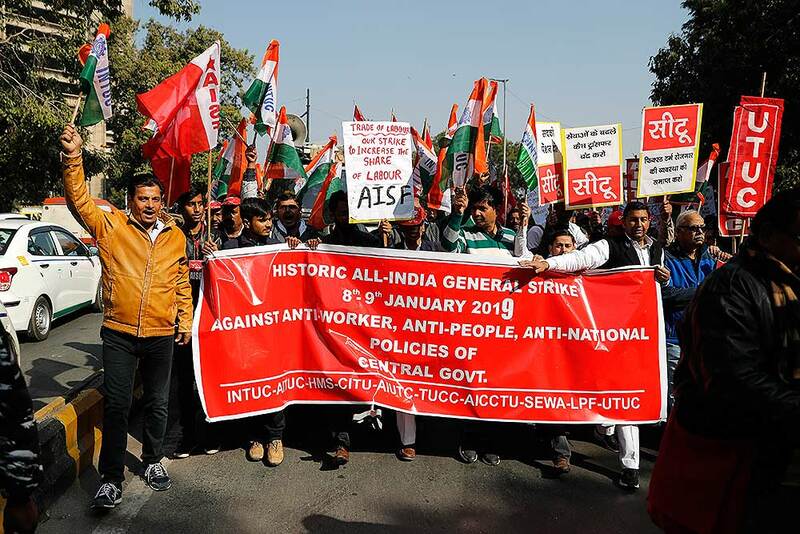 Central Trade Unions Tuesday began a two-day nationwide strike to protest against the Modi government's alleged anti-worker policies and unilateral labour reforms. Around 20 crore workers are expected to join the strike, said trade union leaders. 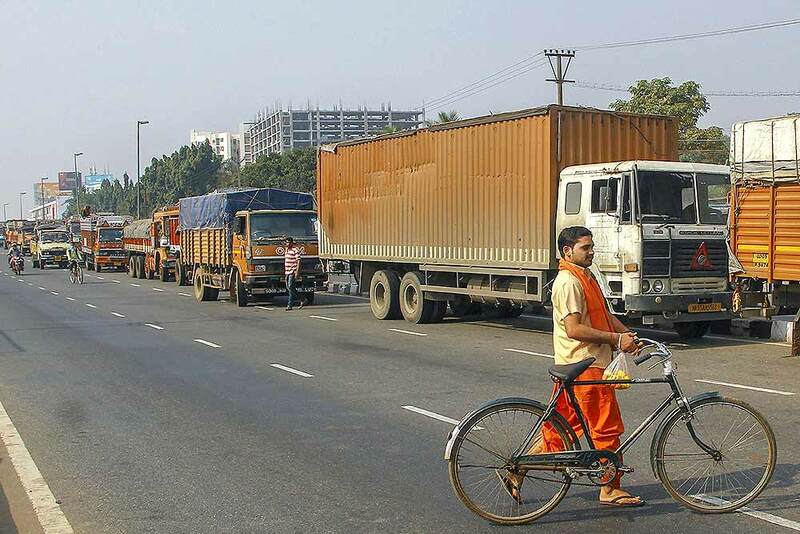 Vehicles remain stranded on the national highway (NH-16) during the 2nd day of 48-hour nationwide general strike called by the central trade unions against alleged anti-worker policies and unilateral labour reforms, in Bhubaneswar. 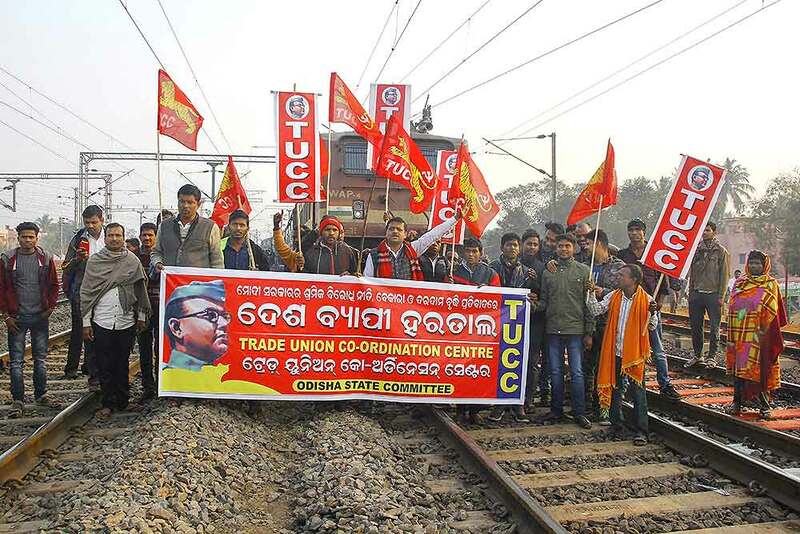 Centre of Indian Trade Unions (CITU) members stop commuters who defied the strike on the 2nd day of 48-hour nationwide general strike called by the central trade unions against alleged anti-worker policies and unilateral labour reforms, in Bhubaneswar. 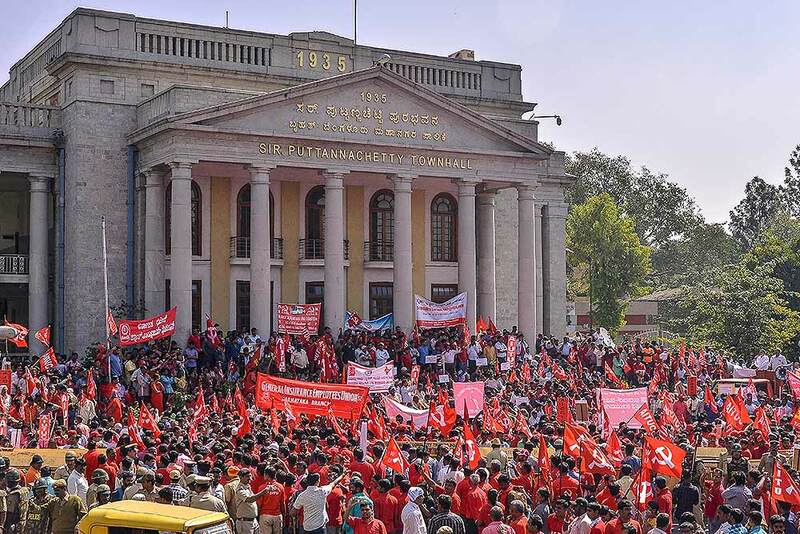 Trade Union activists during a 48-hour-long nationwide general strike called by central trade unions in protest against the "anti-people" policies of the Centre, in Bengaluru. 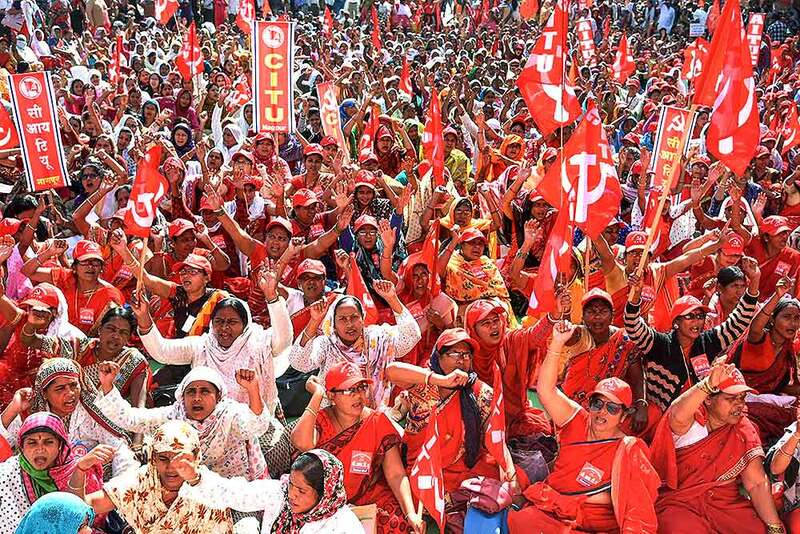 Trade union activists shout slogans as they participate in a demonstration on the second day of a two-day nationwide general strike called by various trade unions in New Delhi. 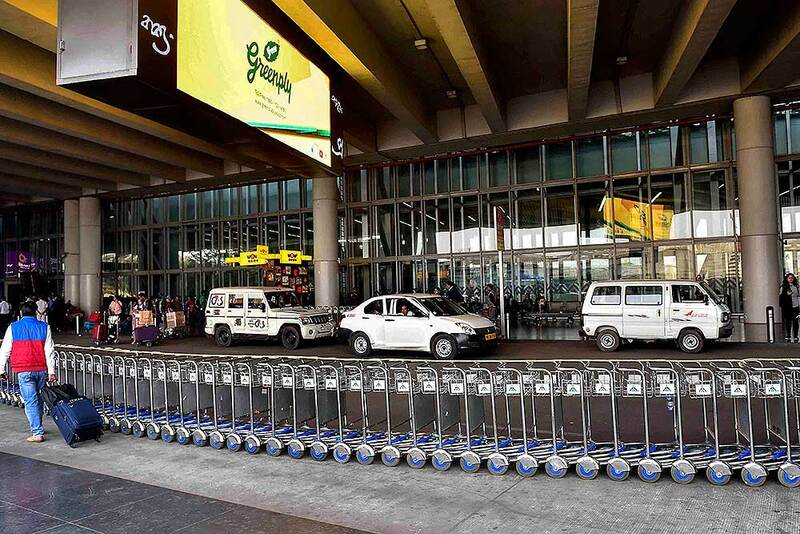 The strike has been called against the government's alleged anti-worker policies and unilateral labor reforms. 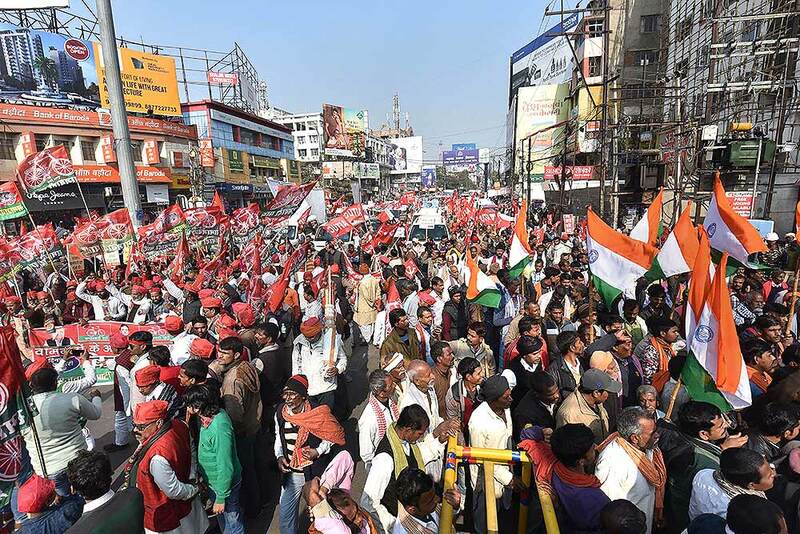 Left parties members and supporters block the Dak Bungalow road during a protest on the 2nd day of 48-hour nationwide general strike called by the central trade unions against alleged anti-worker policies and unilateral labour reforms, in Patna. 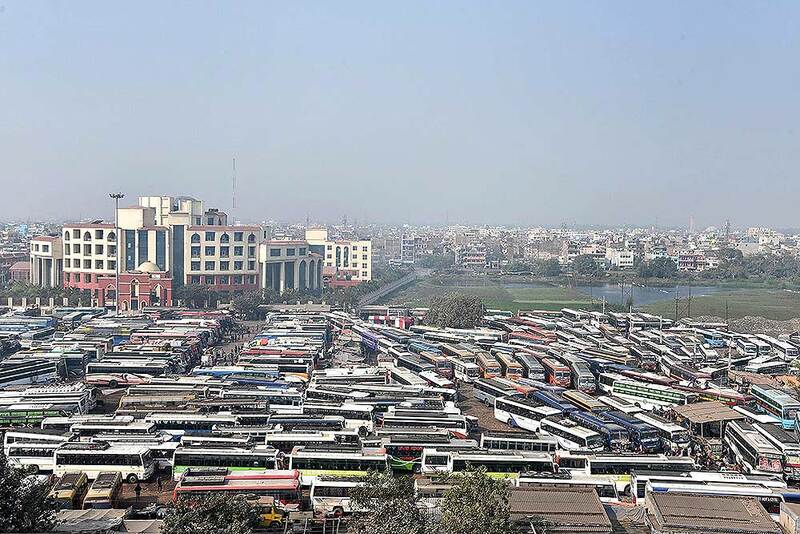 Buses parked at Mithapur bus depot during the 2nd day of 48-hour nationwide general strike called by the central trade unions against alleged anti-worker policies and unilateral labour reforms, in Patna. 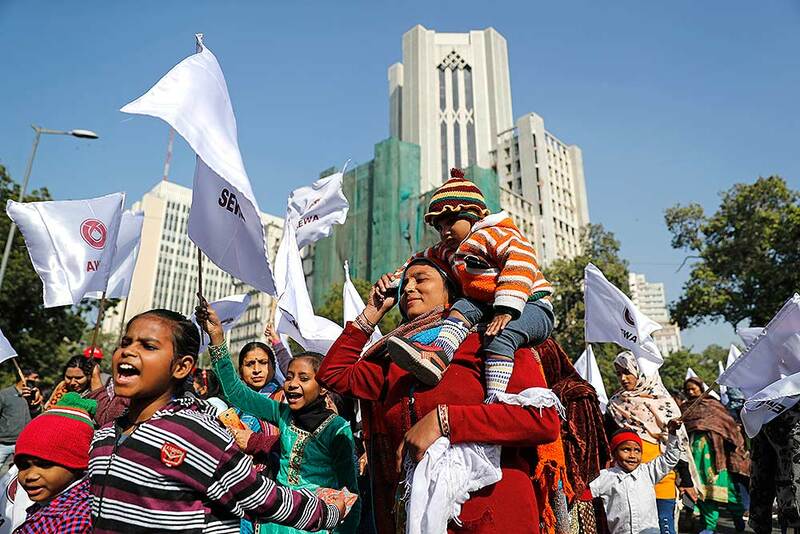 Family members of trade union activists shout slogans as they participate in a demonstration on the second day of a two-day nationwide general strike called by various trade unions in New Delhi. 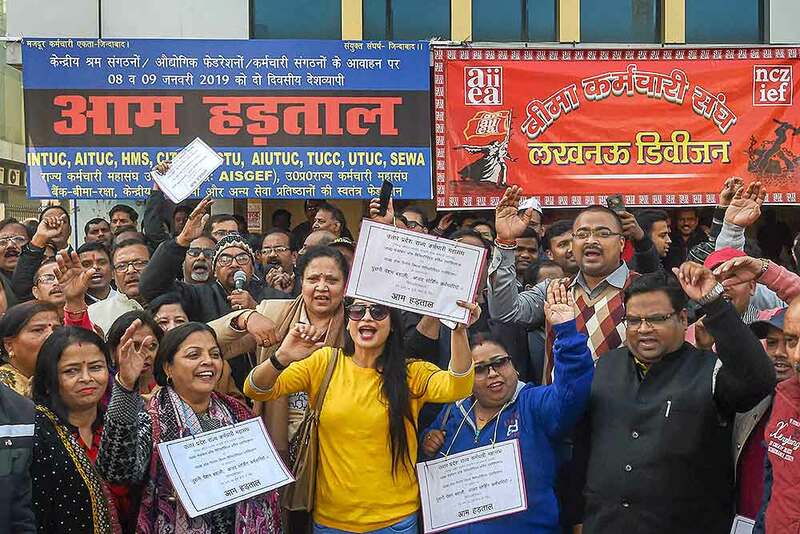 Members of various trade unions raise slogans during the 48-hour-long nationwide general strike called by central trade unions protesting against the "anti-people" policies of the Centre, in Lucknow. 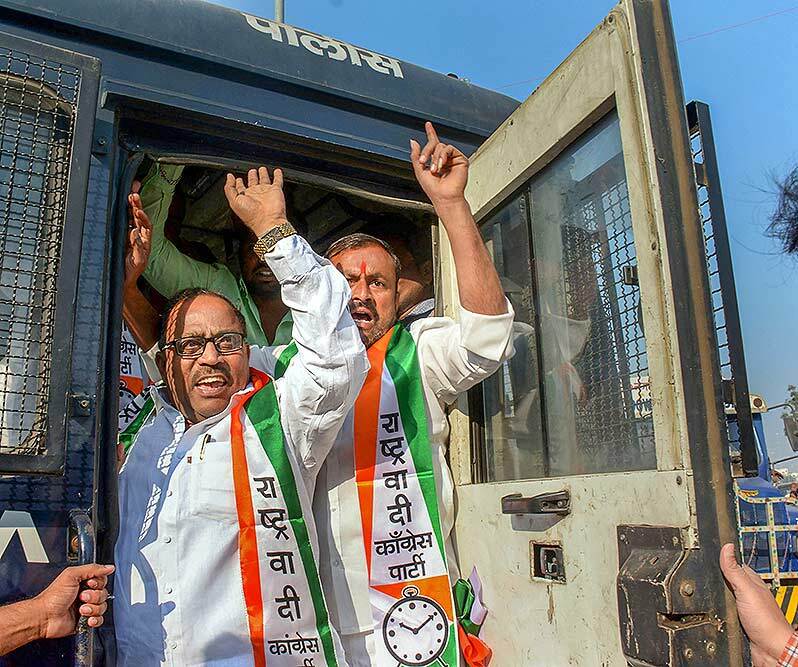 Nationalist Congress Party (NCP) activists demonstrate against the BJP government at Shivaji Maharaj Chowk, in Solapur. 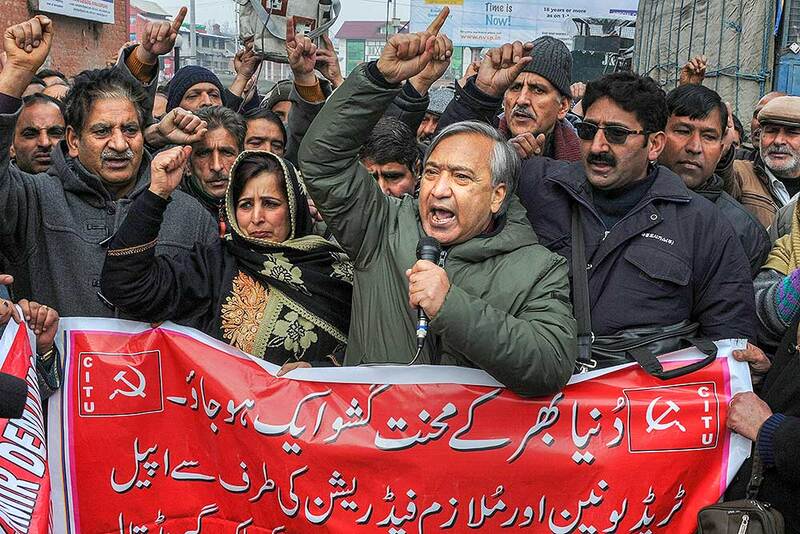 Senior CPI(M) leader MY Tarigami and Centre of Indian Trade Unions (CITU) leaders and workers raise slogans during a protest on the 2nd day of 48-hour nationwide general strike called by the central trade unions against alleged anti-worker policies and unilateral labour reforms, in Srinagar. 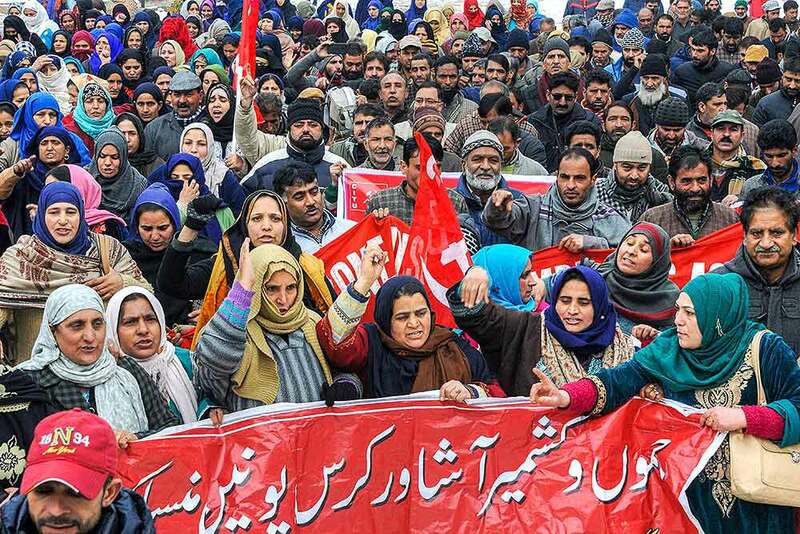 Centre of Indian Trade Unions (CITU) leaders and workers raise slogans during a protest on the 2nd day of 48-hour nationwide general strike called by the central trade unions against alleged anti-worker policies and unilateral labour reforms, in Srinagar. 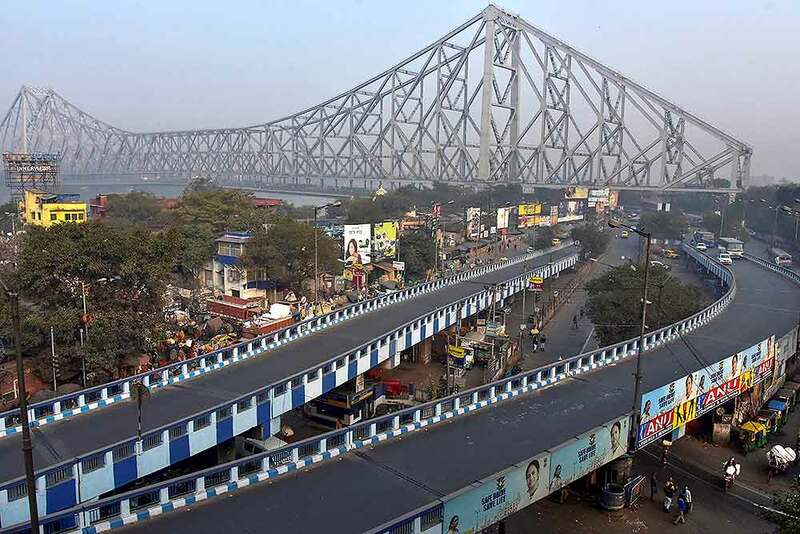 A view of deserted roads near Howrah Bridge during the 2nd day of 48-hour nationwide general strike called by the central trade unions against alleged anti-worker policies and unilateral labour reforms, in Kolkata. 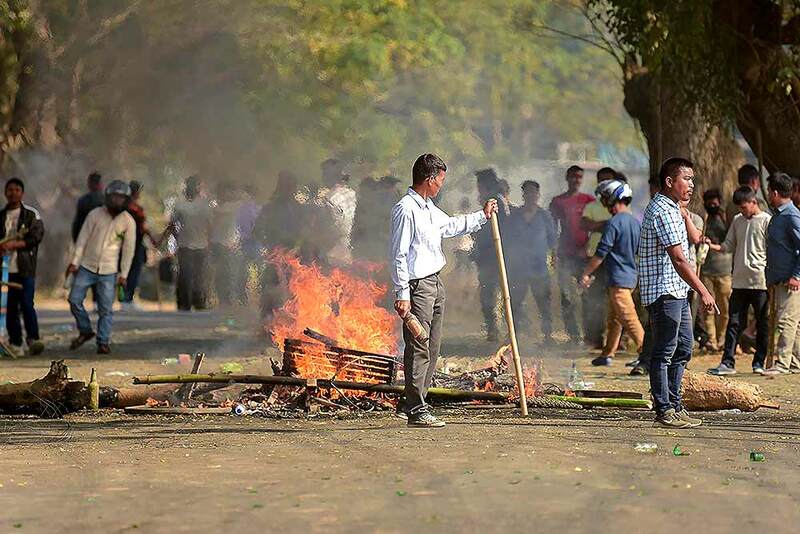 Roads being blocked during the 48-hour-long nationwide general strike called by central trade unions protesting against the "anti-people" policies of the Centre, in Agartala. 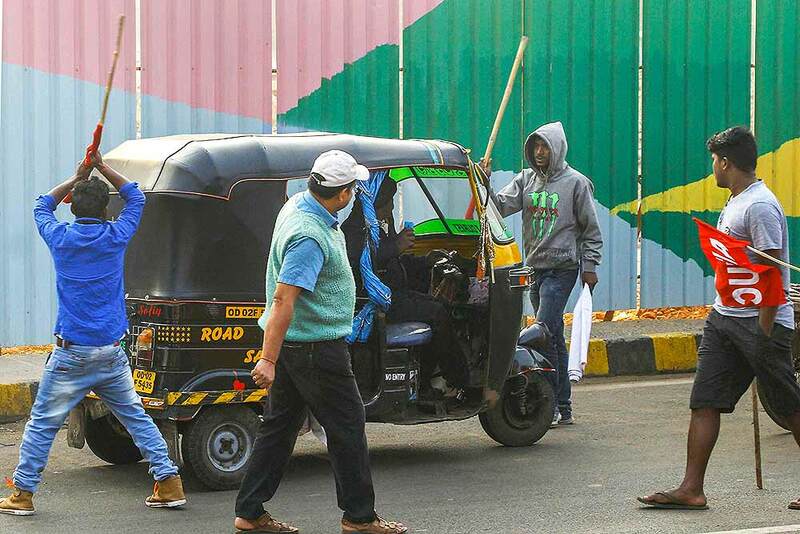 Activists under the banner of Centre of Indian Trade Unions (CITU) raise slogans during the 48-hours-long nationwide general strike called by central trade unions protesting against "anti-people" policies of the Center, in Nagpur. 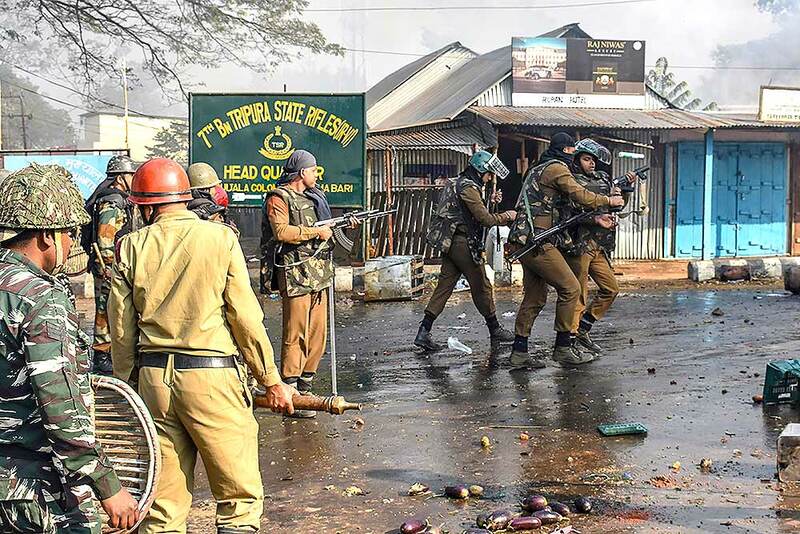 Police personnel control protestors during the 48-hour-long nationwide general strike called by central trade unions protesting against the "anti-people" policies of the Centre, in Agartala. 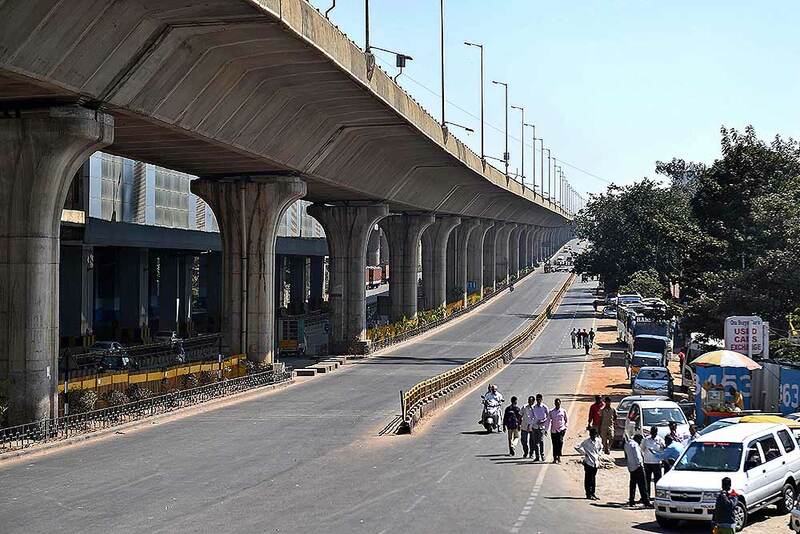 A deserted look of NH-4 during the 48-hour-long nationwide general strike called by central trade unions protesting against the "anti-people" policies of the Centre, in Bengaluru. 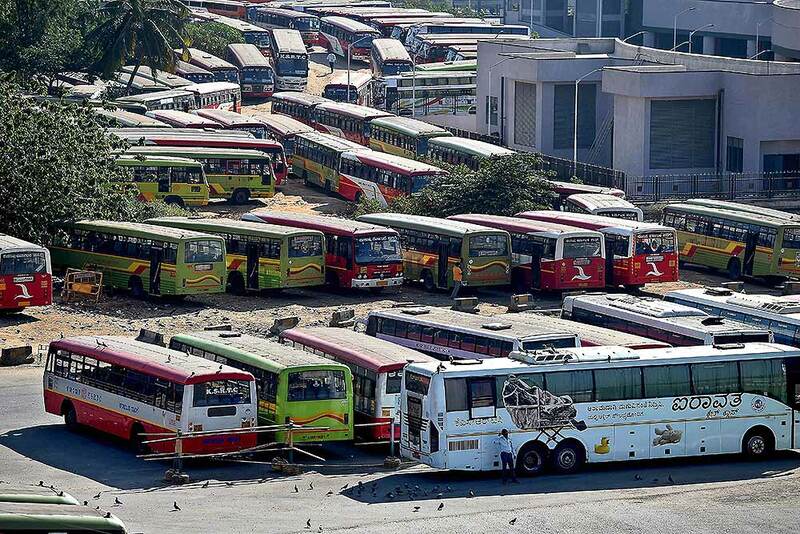 KSRTC buses parked at a bus depot during a 48-hour-long nationwide general strike called by central trade unions in protest against the "anti-people" policies of the Centre, in Bengaluru. 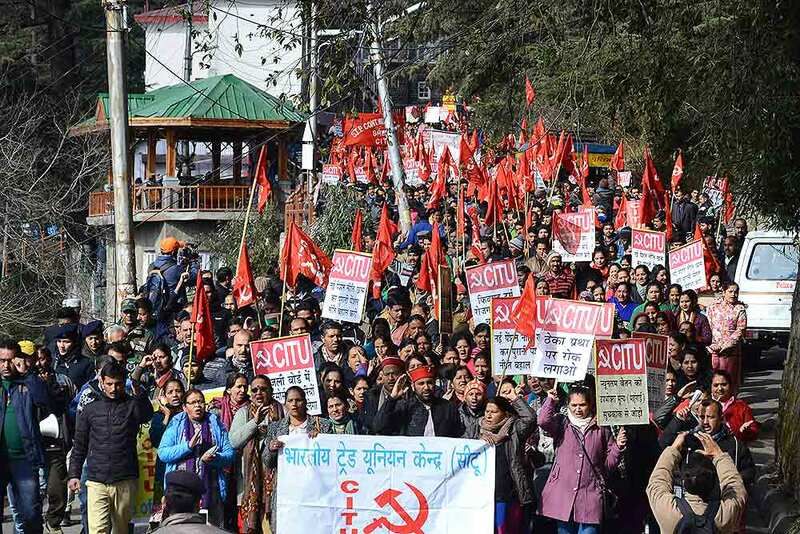 Activists under the banner of Centre of Indian Trade Unions (CITU) raise slogans during the 48-hour-long nationwide general strike called by central trade unions protesting against the "anti-people" policies of the Centre, in Shimla. 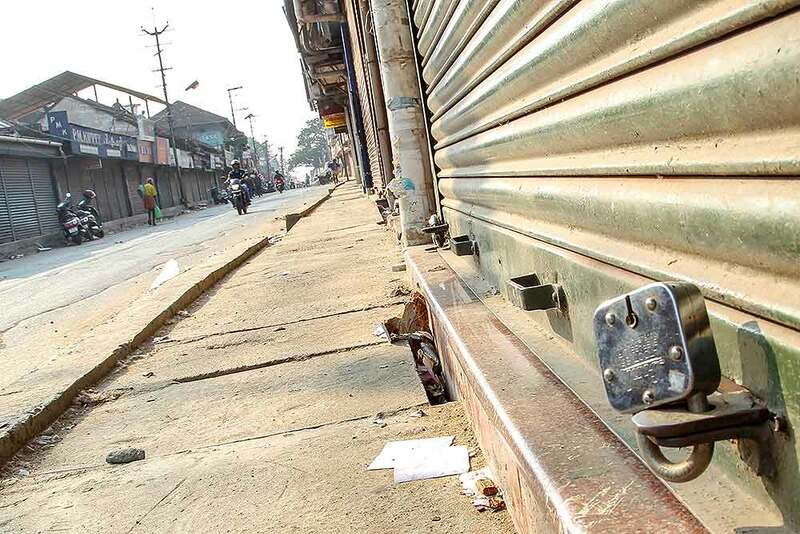 A deserted look of street and closed shops during the 48-hour-long nationwide general strike called by central trade unions protesting against the "anti-people" policies of the Centre, in Kozhikode. 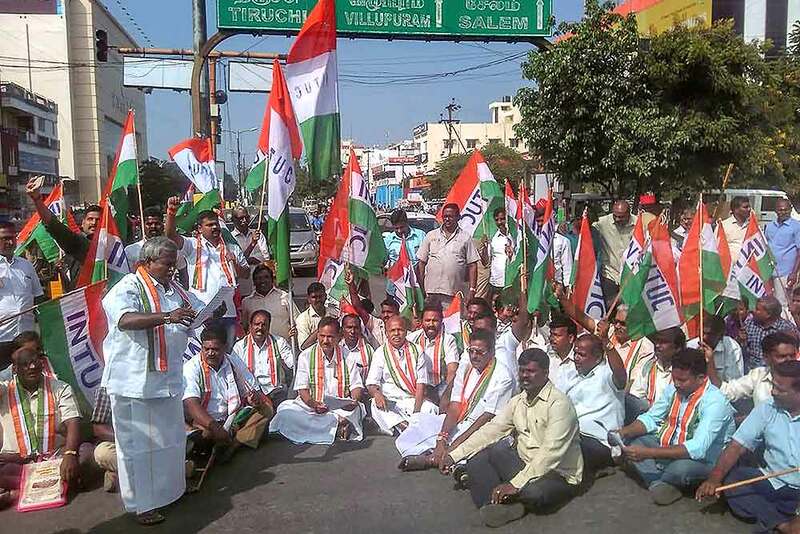 Activists under the banner of various trade unions during the 48-hour-long nationwide general strike against the "anti-people" policies of the Centre, in Puducherry. 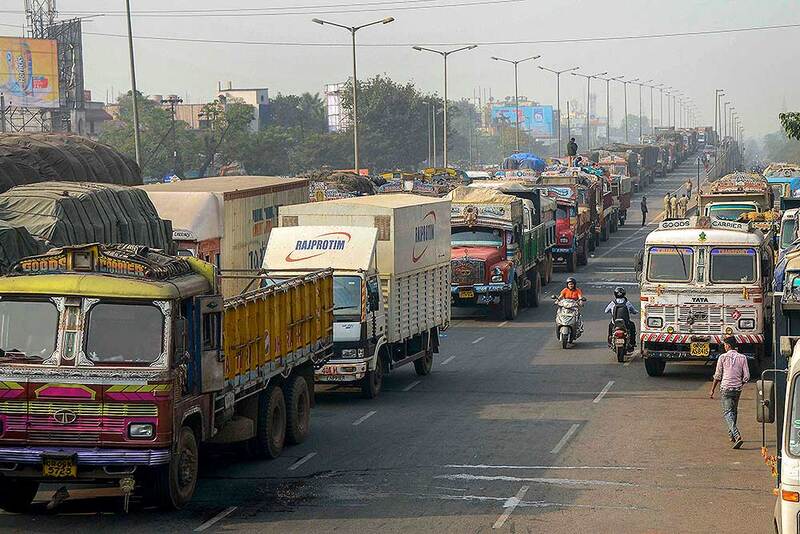 Vehicles remain stranded during a 48-hour-long nationwide general strike called by central trade unions in protest against the "anti-people" policies of the Centre, in Bhubaneswar. 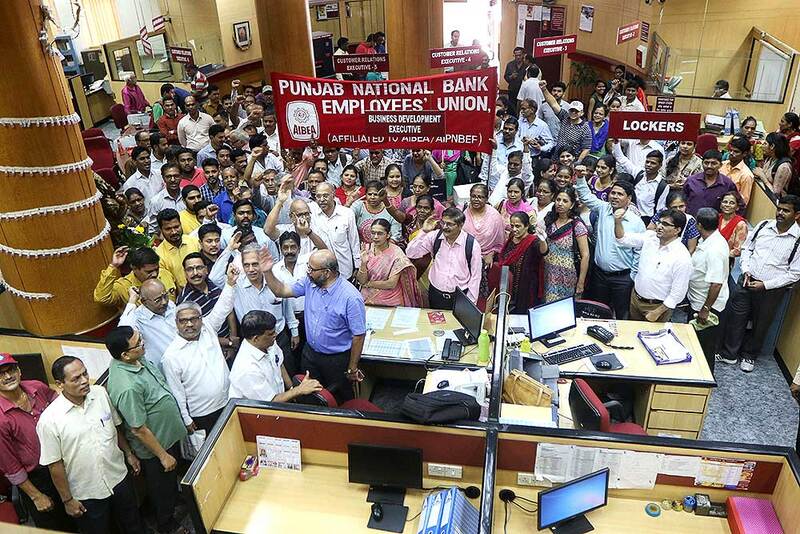 Punjab National Bank employees protest inside their Fort branch office during the 48-hour-long nationwide general strike called by central trade unions protesting against the "anti-people" policies of the Centre, in Mumbai. 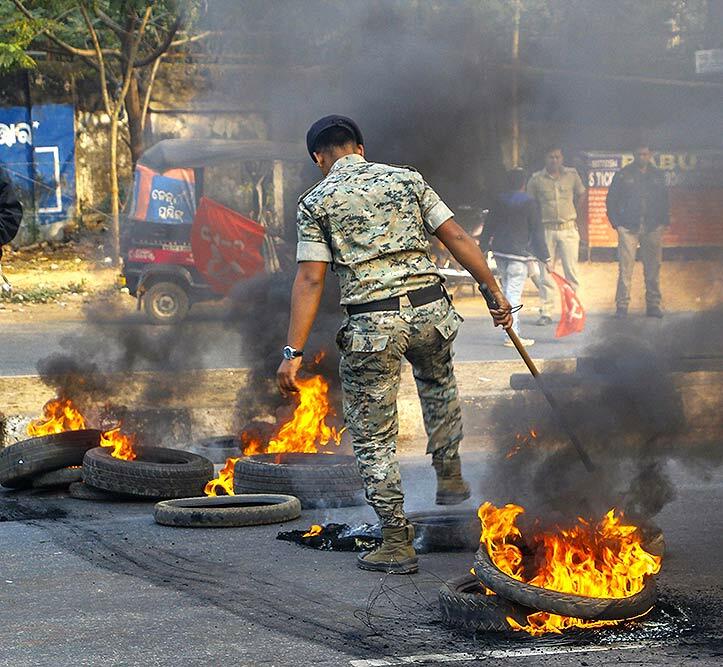 A policeman clears burning tyres off the NH-16 during a 48-hour-long nationwide general strike called by central trade unions in protest against the "anti-people" policies of the Centre, in Bhubaneswar. 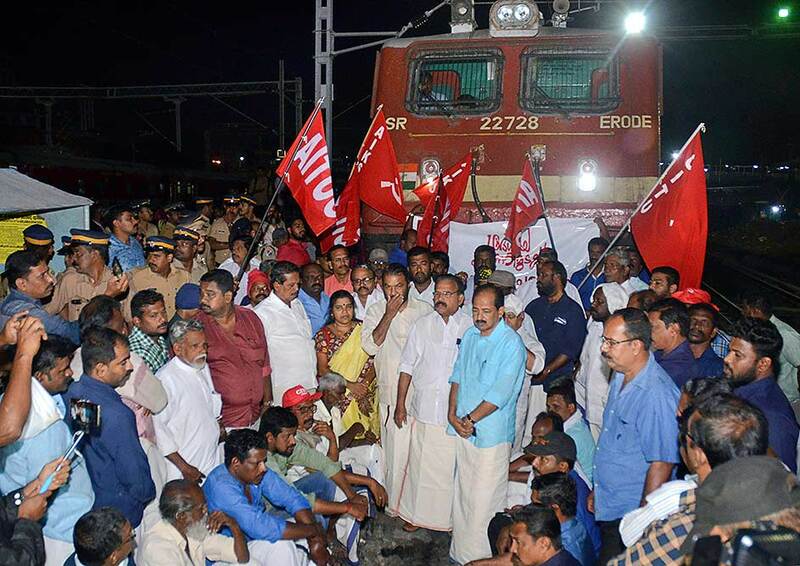 Activists under the banner of All India Trade Union Congress block Venad Express during a 48-hour-long nationwide general strike called by central trade unions in protest against the "anti-people" policies of the Centre, in Thiruvananthapuram. 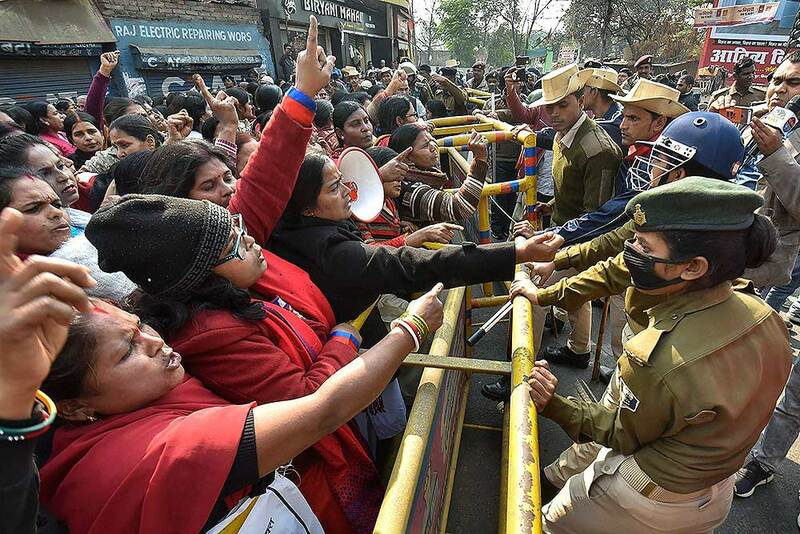 Police personnel clash with protesting Anganwadi volunteers during the 48-hour-long nationwide general strike called by central trade unions protesting against the "anti-people" policies of the Centre, in Patna. 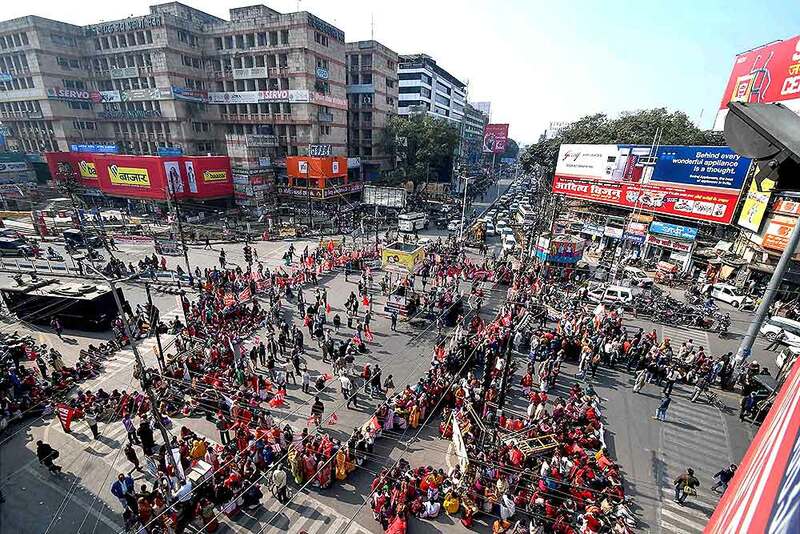 A view of the streets as protestors gather during the 48-hour-long nationwide general strike called by central trade unions protesting against the "anti-people" policies of the Centre, in Patna. 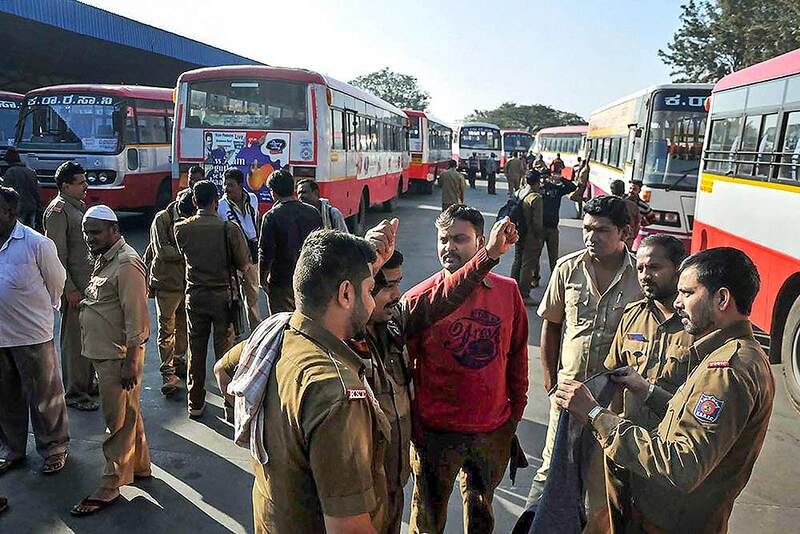 Bus drivers at a bus depot during the 48-hour-long nationwide general strike called by central trade unions protesting against the "anti-people" policies of the Centre, in Chikmagalur. 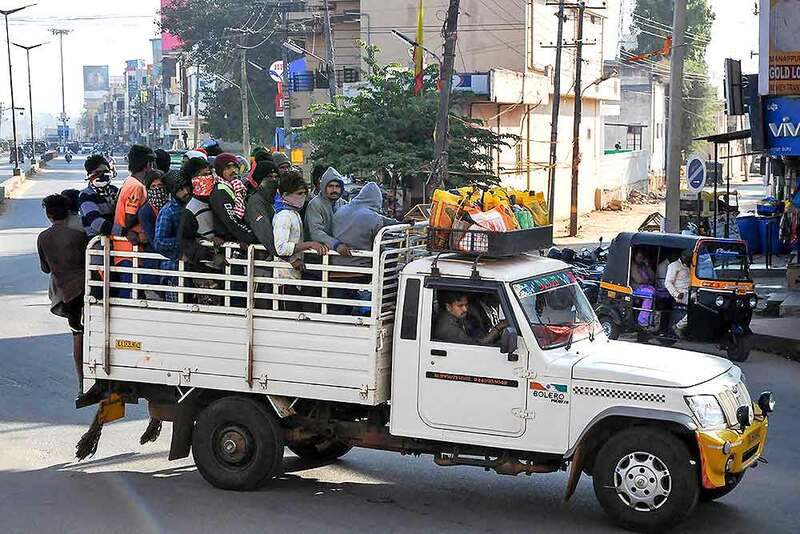 Workers travel in a pick-up van during the 48-hour-long nationwide general strike called by central trade unions protesting against the "anti-people" policies of the Centre, in Chikmagalur. 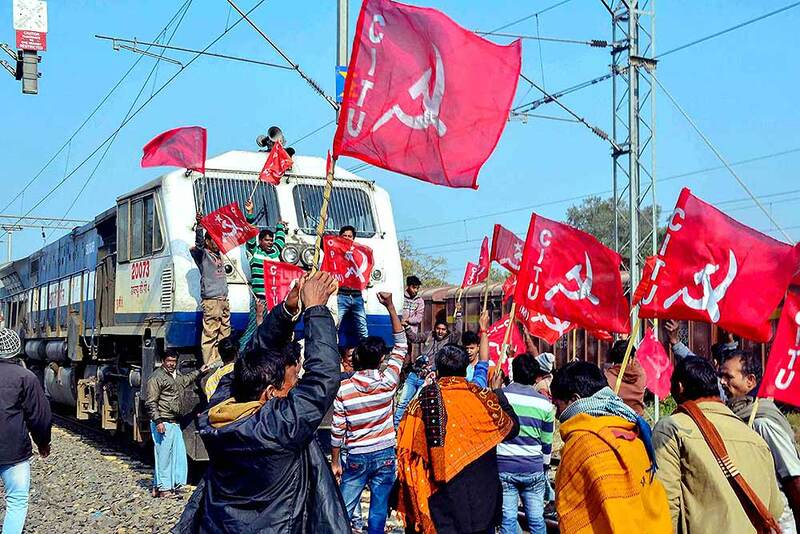 Left Democratic Party block trains during the 48-hour-long nationwide general strike called by central trade unions protesting against the "anti-people" policies of the Centre, in Guwahati. 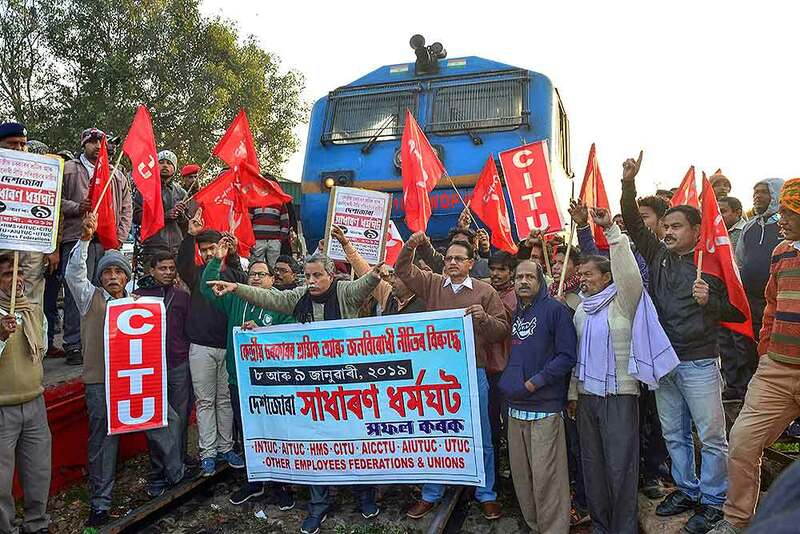 Centre of Indian Trade Union (CITU) activists and ally organizations block a train during the 48-hour-long nationwide general strike called by central trade unions protesting against the "anti-people" policies of the Centre, in Guwahati. 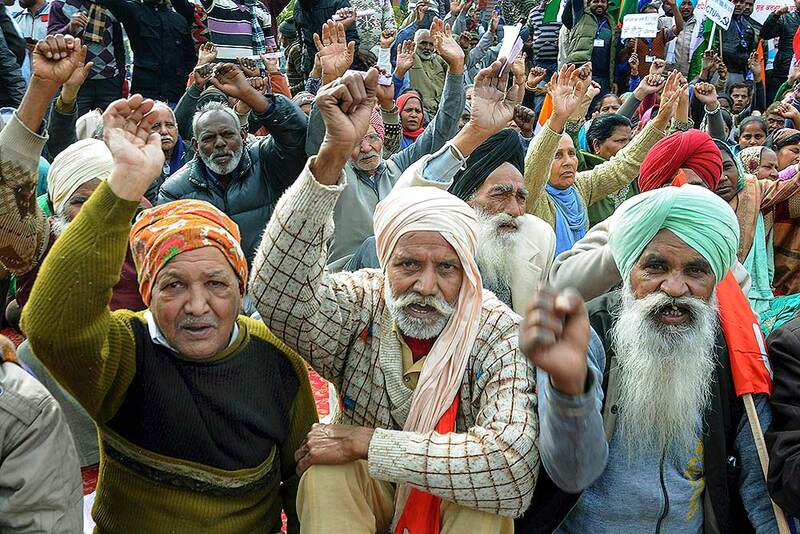 Workers from various trade unions and teachers' associations raise slogans during the 48-hour-long nationwide general strike called by central trade unions protesting against the "anti-people" policies of the Centre, in Amritsar. 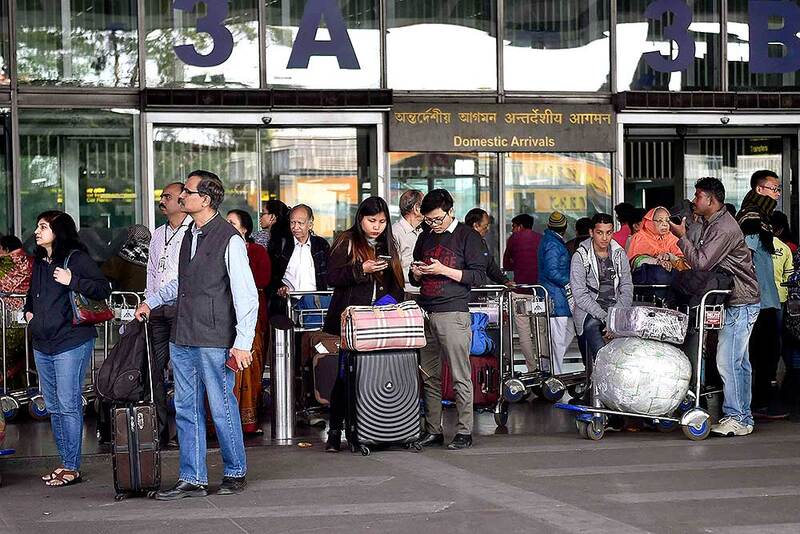 Flight passengers queue up outside a pre-paid taxi counter during the 48-hour-long nationwide general strike called by central trade unions protesting against the "anti-people" policies of the Centre, in Kolkata. 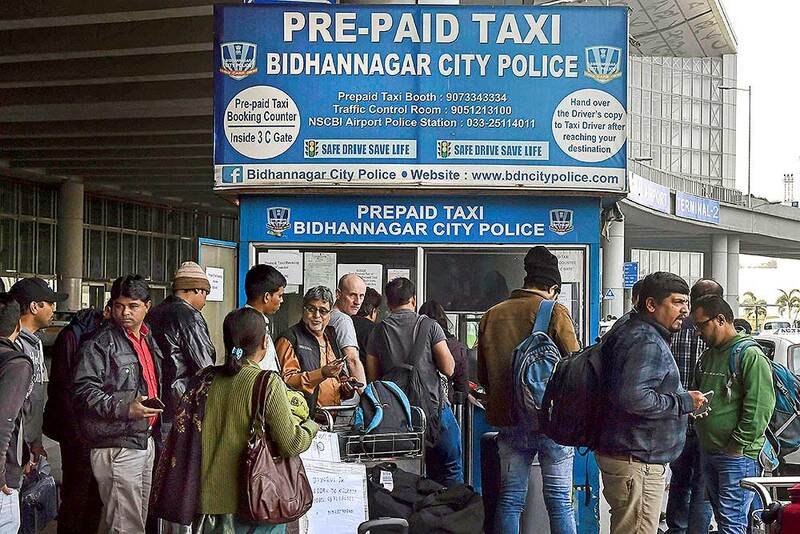 Flight passengers arriving at NSCBI Airport wait for their cabs during the 48-hour-long nationwide general strike called by central trade unions protesting against the "anti-people" policies of the Centre, in Kolkata. 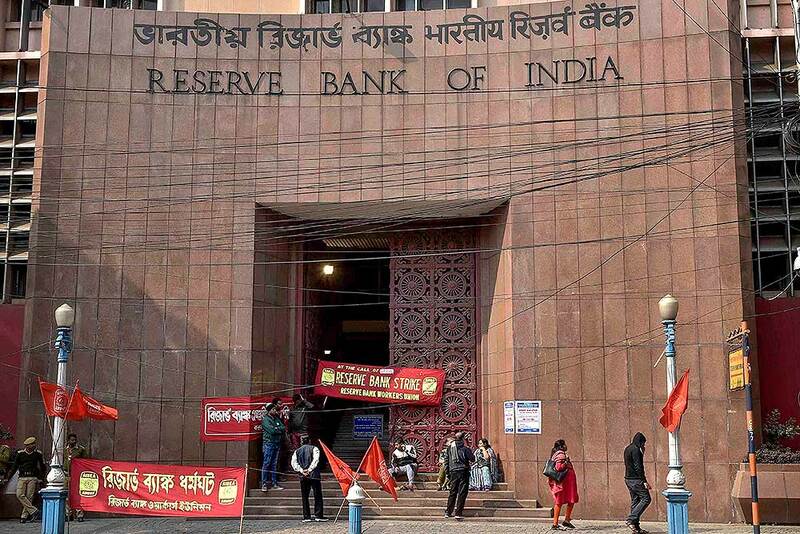 Reserve Bank of India (RBI) employees protest outside their office during the 48-hour-long nationwide general strike called by central trade unions protesting against the "anti-people" policies of the Centre, in Kolkata. 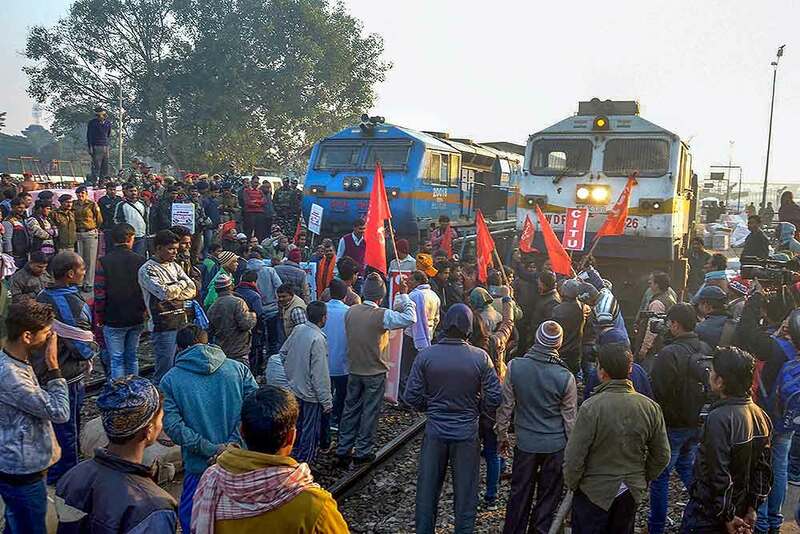 Activists under the banner of Centre of Indian Trade Unions (CITU) block a train during a 48-hour-long nationwide general strike called by central trade unions in protest against the "anti-people" policies of the Centre, in Malda.